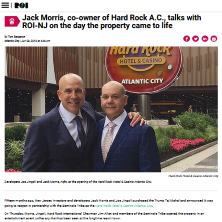 Fifteen months ago, New Jersey investors and developers Jack Morris and Joe Jingoli purchased the Trump Taj Mahal and announced it was going to reopen in partnership with the Seminole Tribe as the Hard Rock Hotel & Casino Atlantic City. On Thursday, Morris, Jingoli, Hard Rock International Chairman Jim Allen and members of the Seminole Tribe opened the property in an entertainment event unlike any that has been seen at the longtime resort town. After the day’s events settled down — and the last guitars were smashed — Morris sat down with ROI-NJ to discuss all things Hard Rock and Atlantic City.